Vinyl Wall Mural Beautiful summer mountain landscape. Vinyl Wall Mural Beautiful Vista of Mount Hood in Oregon, USA. 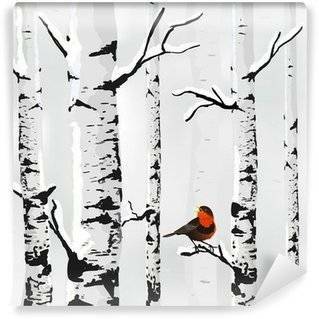 Vinyl Wall Mural Sunset in a winter forest. According to the psychology of colors, green is considered to be the most relaxing color. It symbolizes peace, solace and relief. If you want to introduce this effect in your own house, you should invest in themes related to nature. Vinyl Wall Mural Aerial of palm forest in the mist. Vinyl Wall Mural Forest in the fog. Minimalistic illustration. Digital drawing. Vinyl Wall Mural Autumn oak forest seamless botanical pattern. Vinyl Wall Mural Puddle of water in misty tropical forest. Vinyl Wall Mural Pine forest floral seamless pattern.Watercolor illustration with berry, coniferous branch,pinecone,moss, mushrooms,lichen.Watercolor hand drawn illustration. The noise, neons and urbanized space are the typical features of the city image, with which we’re often fed up. It tires us and tells us to flee with our thoughts somewhere else. Everyone dreams of a moment of relaxation. Now you don’t have to travel abroad. There are plenty of ways to achieve a relaxing state of calmness. The best, however, are the simplest solutions - nature, forest, trees. Decide which room is to become your oasis of peace. 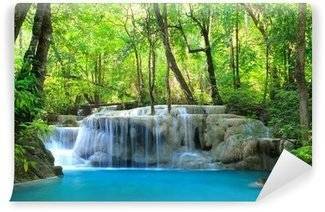 Wall mural with the image of the forest will look equally beautiful in the living room, hall or bedroom. It will help you slow down for a few moments, restore your balance and catch some rest from the urban noise. Never before was nature that close to you. Would you prefer to look at a deciduous or coniferous forest on your wall? 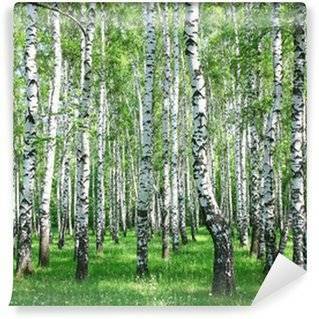 You can bet on the classics like the birch forest pattern. Alternatively, we propose the bamboo forest or the rainforest theme, thanks to which your house will get inhabited by a more exotic atmosphere. How about different seasons? A spring forest, awakening to life, or its colorful autumn face. Or maybe either the woods in the summer robe or covered in white snow – tell us which version you prefer. The fact that you live in a city agglomeration, the center of world's business, does not matter. You can feel the nature right in your house. 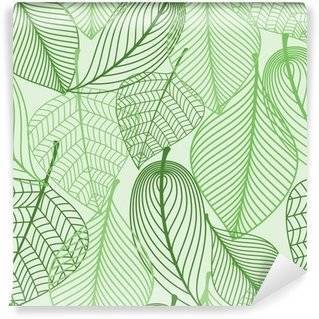 Here comes a collection of patterns for true nature buffs. Forest land on your doorstep? If you’d like for your room to imitate such landscapes, wall murals with the images of forest will be perfect for you and your four walls. For the full effect, you can also use furniture made from authentic materials. Timber and forest wall mural will complement each other and create an interesting combination.